Osteochondritis dissecans refers to the separation of osteochondral fragments from the bed of the joint surface. Definition of lesion goes by the existence of an open epiphyseal line in a juvenile form and the absence, representing an adult form. The treatment of osteochondritis dissecans depends on age, on the epiphyseal line, its length, location and stability of the lesion. A conservative treatment is preferred in juvenile cases; a surgical intervention may be necessary for unstable lesions and those not responding to conservative approaches. Showing no positive development in symptoms and physical status for six months, our 16-year-old male patient received two intraarticular platelet rich plasma injections three months apart, focusing on the lesion of osteochondritis dissecans localized in the right knee. At the end of the 18th month, the patient did not show any limitation in his physical activities and radiographic examination confirmed the successful treatment. Having obtained positive results, we believe that PRP injections are a safe, simple, and minimally invasive treatment option for juvenile OCD which doesn’t respond to conservative therapy before a surgical approach. Osteochondritis dissecans (OCD) is a disease characterized by the separation of an osteochondral fragment from the bed of its joint surface due to impairment in the blood supply of the subchondral bone.1,2 Although its exact etiology is still unknown, acute or repetitive microtrauma, ischemia, genetic and endocrine pathologies have been implicated as etiologic factors.1,3,4 There are two main types of OCD, juvenile and adult, occurring before and after the closure of the physis, respectively.2,5 Its incidence increases as children get more involved in regular combat sports and peaks at the ages of 15 to 20 years.1,3 OCD mostly occurs in knee joints, with typical location in the lateral aspect of the medial femoral condyle.2-4 Although direct radiographs are sufficient for its diagnosis, magnetic resonance imaging (MRI) provides valuable information for the assessment of integrity of the joint cartilage, size and stability of the osteochondral lesion, the prognosis of the disease as well as for determining the choice of treatment.1-4,6 Its treatment varies depending on the patient’s age, complete or incomplete closure of the physis, and the size, location, and stability of the lesion.1,2 The juvenile form is likely to respond to conservative treatment methods.1,2,4-6 However, surgical procedures may be required when conservative treatment fails or in the presence of an unstable osteochondral fragment.2,4 Research has shown the healing rate for conservative treatment after 6-months to be only 50%.7 Platelet-rich plasma (PRP) is blood plasma, enriched with platelets and growth factors. It shows healing effects on impaired tissues of the musculoskeletal system and speeds up the regenerative process.8,9 In-vivo studies on the effects of PRP on cartilage repair in the knee joint were mostly related to degenerative cartilage and osteoarthritis.9 The use of PRP in OCD lesions was mainly limited to the ankle joint9 as our literature search provided no data referring to the application of PRP for OCD lesions of the knee joint. On the grounds of the effectiveness of PRP on injured tissue and due to it’s promising outcome in in- vitro and in-vivo studies, we decided to proceed with PRP injections in order to improve our patient’s comfort and quality of life. In this case report, clinical and radiographic results of an adolescent patient were presented in whom OCD of the knee joint did not respond to conservative treatment. PRP injections, however, lead to complete recovery and total healing of his lesion. Figure 1. MRI scans of the patient after three months of conservative treatment: Coronal (A) and sagittal (B) T2- weighted images show an OCD lesion and a markedly hyperintense fluid density between the lesion and the subchondral bone. Sagittal T1-weighted image (C) shows an irregular lining between the osteochondral cartilage and subchondral bone without a split on the cartilage surface. Figure 2. 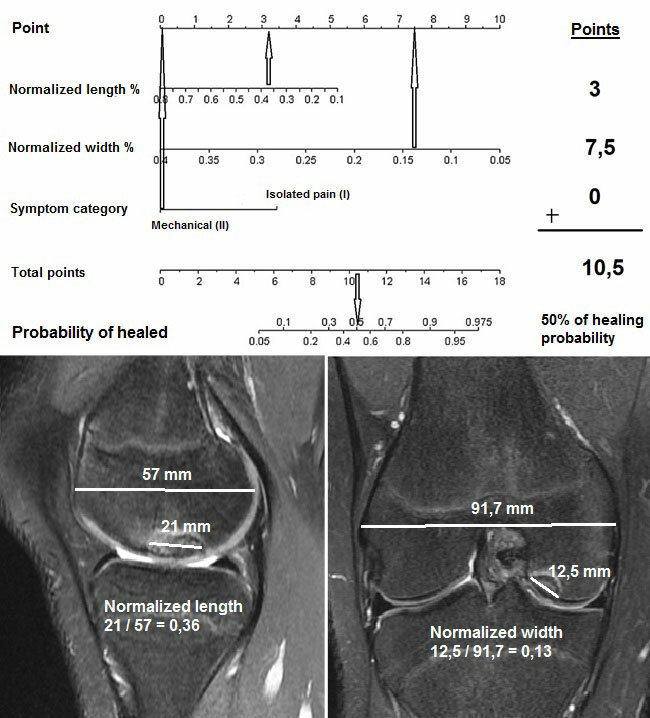 Figure shows the calculation by using the nomogram based on the lesion size and symptom type to help predict the healing potential of the osteochondral lesion. For this calculation, length of the lesion on the sagittal plane and width on the coronal plane are proportioned to the diameter of the epiphysis measured on the same planes and normalized length and width are calculated. Symptom category is also defined, in relation to the patient’s mechanical symptoms. Afterwards, calculated values are signed on the related lines and their counterparts are defined on the point located at the upper side of the scale (white arrows). The sum all of three points is then marked on the total point line and a vertical line drawn down from the total point line to the probability of healed line. Figure 3. Coronal (A) and sagittal (B) T2-weighted images obtained three months after the first PRP injection show decreased subchondral fluid density. Both T2 and sagittal T1-weighted images (C) show decreased lesion size compared with the initial sizes measured by the baseline MRI examination. The lesion decreased to a size of 8.75 mm (depth 6 mm) in the medial-lateral plane on frontal T2-weighted images, and to 13 mm (depth 6 mm) in the anterior-posterior plane on sagittal images. A subsequent PRP injection (5 ml) was administered 3 months after first injection. After another three months of follow-up, the patient reported complete resolution of his knee pain, without any functional limitation. At this stage, the IKDC score was 91 and he was cleared to return to his sportive activities. On the 18th month after his first PRP injection, the IKDC score was 100. The patient reported no restriction in his physical activities and that he started playing tennis regularly again. The final MRI and radiographic examinations showed no boundaries specific to the lesion. (See Figure 4.) During his last visit, written informed consent was obtained from the patient and his parents for this case presentation. Figure 4. CThe final MRI images obtained 18 months after the first PRP injection. Coronal (A) and sagittal (B) T2-weighted images show no boundaries specific to the lesion and complete disappearance of the subchondral edema. Sagittal T1-weighted images (C) show preservation of the cartilage integrity and formation of a clear line with the subchondral bone surface. Healing rates of juvenile OCD lesions with conservative methods range from 50% to 67% in various reports.12-16 Uppstrom et al. report a 50% chance of healing with conservative treatment and refer to nomograms in order to calcualte the possible percentage of healing.7 These treatment methods include analgesic and anti- inflammatory medications, restrictions in sportive activities with modifications, brace or splint-cast immobilization, and physical therapy and rehabilitation protocols.4,5,17 The osteochondral lesion is considered stable when the diameter is less than 2 cm in open epiphysis plates, if continuity of articular cartilage is intact, and if no cystic lesion is present in subchondral area. A high likelihood of spontaneous healing was observed in stable lesions located on non-weight-bearing surfaces.1,2,4-6 Evaluation of the prognosis of OCD lesions should not only include the age of the patient and the skeletal maturity but also the size, the localization, and imaging features of the lesions. Apart from depicting localization, size, and relationship of lesions with intact surrounding tissues, MRI provides valuable information as considering a separation of the lesion from its bed and the responce to conservative methods.16,18 O’Connor, et al.18 asserted a high-density signal line indicating fluid accumulation behind osteochondral fragments, exhibiting an association with fissures or defects in articular cartilage on T2-weighted images, and showing normal density on gadolinium-enhanced images suggesting tendency for osteochondral part to separate from its bed. The authors advise examining T1-weighted images stating, if T1- weighted images show a split of cartilage, high-density signal line on T2-weighted images denote instability with 45% to 85% possibility. Contrary, some authors proposed the increased intensity signal behind the lesion on T2-weighted images being accounting for presence of vascular granulation tissue, thus suggesting healing of lesion.2,6 Yoshida, et al.6 noted spontaneous healing in nine of 16 patients with high-density fluid line behind the osteochondral fragment and proposed the high-density dual-line behind fragments being used as evidence of separation. Additionally, the presence of large homogeneous line below the lesion greater than 5 mm and a focal articular cartilage defect or a subchondral cyst greater than 5 mm were defined as instability criterion.2 In our case, to predict non-operative healing potential of the OCD lesion, we used nomogram developed by Wall, et al.12 using a regression analysis method. This measurement incorporates normalized values obtained from division of sagittal length and frontal width of the lesion by the diameter of the epiphysis on the same MRI images and the patient’s symptoms. After the insuffieciency of the six-month conservative treatment, MRI-based calculation yielded a 50% healing probability of the osteochondral lesion in our case. The increased signal intensity behind the lesion on T2-weighted images and irregularities on the cartilage surface on T1-weighted images were considered to significantly reduce the chance of improvement by conservative treatment. As the patient’s age gets closer to adulthood, the sooner the epiphyses will close, causing the length of conservative treatment to be shorter, and lowering the likelihood of non-operative healing.4,5 In cases of OCD lesions becoming unstable or conservative treatment failing, the lesion may separate from the cartilage bed, turn into a free fragments, and trigger a degenerative process within the knee joint. The need for surgical intervention has been emphasized in such cases,2,4 including arthroscopic transarticular or retroarticular drilling, microfracture surgery, internal fixation of the fragment, mosaicplasty or osteochondral allograft transplantation, autologous chondrocyte implantation, and fragment excision. Although success rates of surgical procedures range from 75% to 100%5, lesions unresponsive to conservative treatment, another treatment option before surgery may be less invasive methods. Platelet-rich plasma contains growth factors (TGF-beta, PDGF, FGF, EGF, VEGF, IGF-1, etc.) stored in alpha granules within platelets and play an important role in tissue healing. Injections of PRP allow factors to act favorably on angiogenesis of damaged tissues and control local inflammation, resulting in inhibition of catabolic enzymes and cytokines, accumulation of stem cells and fibroblasts in damaged tissues, proliferation of chondrocytes, and stimulation of type II collagen and proteoglycan synthesis, accelerating healing process.8,9,19 The use of PRP injections for osteochondral lesions is often accompanied by arthroscopic applications expediting the healing process.19 No other case of OCD improved solely after PRP injections following failure of conservative treatment and without needing surgery has been reported. The main objective of OCD treatment is ensuring union of the lesion with the underlying subchondral bone without damaging the cartilage integrity, preserving the patient’s own cartilage. Compared to arthroscopic interventions, the PRP application is minimally invasive, safe, reproducible, and less expensive with very few to almost none adverse effects. In case of conservative treatment failing, intraarticular PRP injections can still provide rapid radiographic, clinical and functional improvement in OCD lesions encountered in adolescents and decrease the need for surgical intervention, as seen in our case. Hauser R. Article and updates for general readership on osteochondritis dissecans.